Winter has finally arrived in my home town Split, and gave me the perfect reason to pull out of my wardrobe all the wonderful coats and boots which were waiting patiently for their time of the year. It is essential to have nice and quality black boots and black coat in your wardrobe. They are easy to combine for work or casual outings, and can be quickly changed with a simple touch of nice shawl or some statement jewelry. What are yours favorites winter favorites, do tell ! Until the next year, I wish you all happy New Year – 2014 was great, and I can’t wait to meet 2015! She can look sophisticated for work, but also playful at day and mysterious in the evening. She is a great basic color and a must in every fall and winter wardrobe – combinations are endless and don’t have to be plain and boring. I hope you will get some fashion inspiration from today’s look ! Frida Kahlo, the famous Mexican painter, was truly a definition of an empovered, beautiful, and a unique woman. She lived a life which consisted of many ups and downs, life of constant pain, enormous talent, and a will to live to the fullest. In her paintings she prefered a lot of patterns and colors, and her own personal style reflected that. Flowers in her hair, big golden earrings and necklaces, long ruffled skirts and her trademark unibrow made her a person to remember and admire. Today her self-portraits and paintings are widely recognised, and she is a constant inspiration to fashion designers. I deeply admire her, and I love her work, her strength, and her fantastic fashion sense. 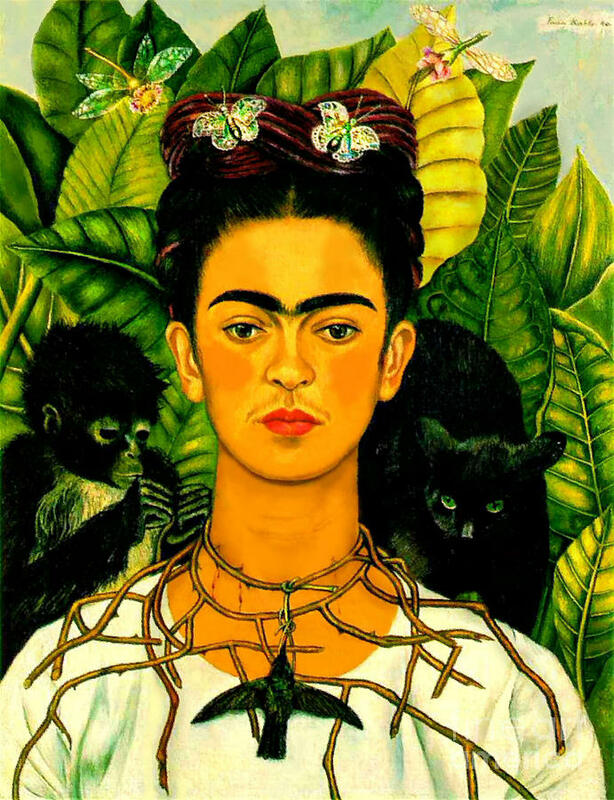 I possess a lot of jewelry, but I often end up with one of my favourite pairs of earrings – a picture of Frida’s self-portrait with a thorn necklace and a hummingbird. When I put them on, I feel womanly, strong, and proud at the same time.